Smog, drones, staircases, and energy drinks: these are the objects that dominate Frankfurt-based artist Anne Imhof’s performative installations. These inanimate articles and states are sometimes joined by falcons, horses, and bunny rabbits. Composed almost entirely of immaterial gestures, Imhof’s work exists at the intersection of contemporary dance and theatrical spectacle, replicating a sentiment of youth culture that permeates every context she operates within. Her interests lie in negotiation, and the non-vocal gestures through which power flows—often evoking senses of melancholia, sadness, and angst—but can these psychological states usher a form of critique? The concept of Gesamtkunstwerk, an element present in Imhof’s work, was envisioned by German composer Richard Wagner as a total integrated work of art bridging theater, music, spectacle, and stage design. 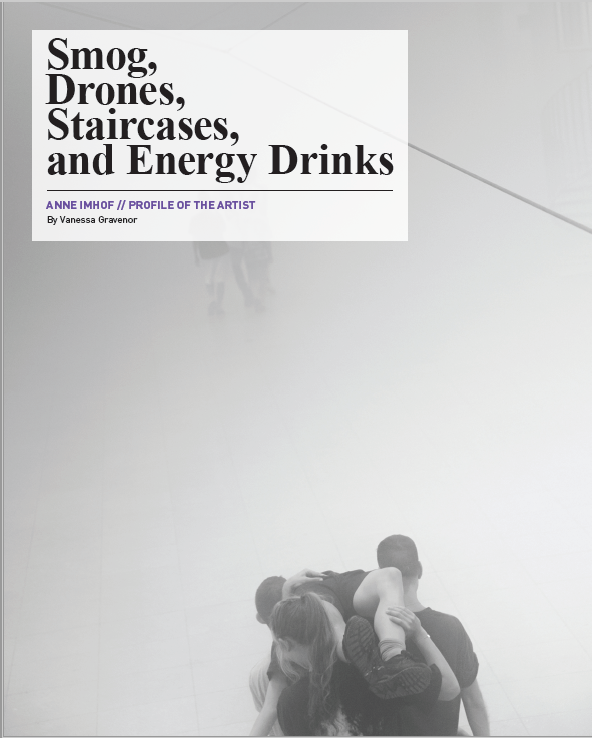 As such, it was assumed to speak to a revolutionized subject—for Imhof, society exists far away from the thresholds of any revolution, revealing instead an audience fully wound into addictive and narcissistic tendencies. Imhof’s performances are attuned to the darkness of our times, inviting the audience to celebrate in its hedonistic catastrophe. 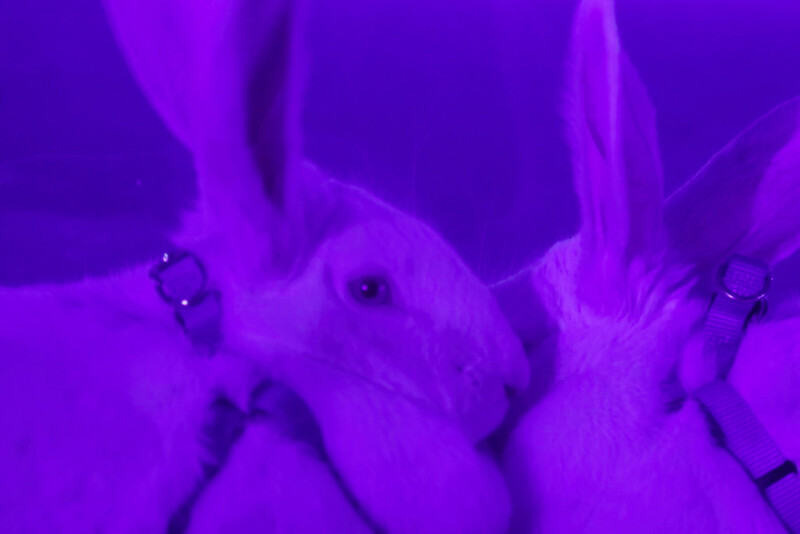 Angst, the title of Imhof’s series of situations—which since 2015 has been exhibited at the Hamburger Bahnhof, the Kunsthalle Basel, and La Biennale de Montréal— is a durational performance that consists of a cohort of performers entranced in a youthful melancholia bordering on catatonia. 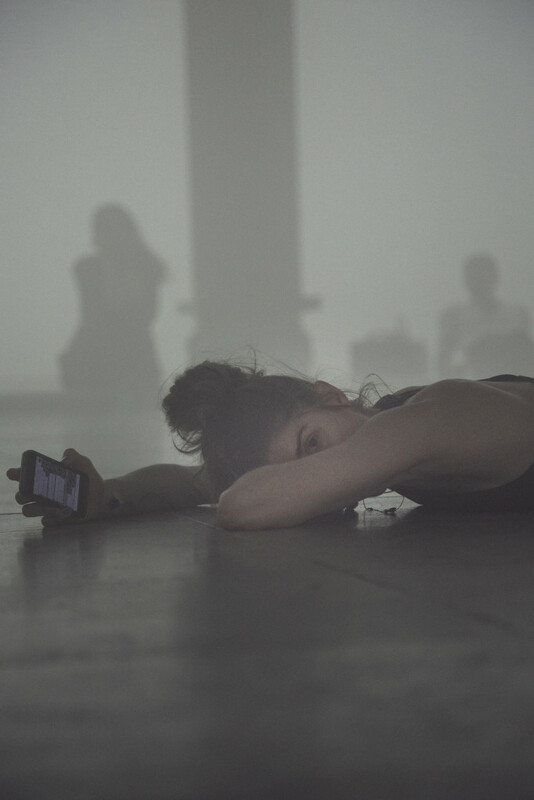 In the first of the performances, at Hamburger Bahnhof, Angst I (2015), the gallery was fitted with pools of water, smartphones affixed to the wall. The primary gestural association that arises out of the pools is Narcissus—who, as in the myth, is so betaken by his beautiful reflection that he is rendered immobile, frozen in his pose. Here, it is both the pool of reflecting water and the smart screen stuck to its rim that calls us to become an object, a contemporary variation on the epic. Likewise, the room— black-lit and bathed in violet—operates as its own vibratory sensation, a symbol recalling the instability of the digital. The second staging, Angst II (2016), took place in the institution’s large cavernous hall under its celestial lighting, fog infused into the air. In both iterations of the performance, as is consistent in Imhof’s oeuvre, the performers are adorned with regular street clothing—sweatpants, graphic T-shirts, and sneakers. Standing alongside technological devices, they transgress and defile the architecture they occupy. Ignoring the audience, rather than addressing them in any political manner, Imhof’s contrasting tactics recall ‘alienation affect’—a theatrical tactic developed by Berthold Brecht in the early-twentieth century, which was devised to move the audience through the division between spectator and spectacle and additionally performer and character. Used to create a literal and metaphorical mirror to the woes of the times, Imhof’s work finds itself at this specific juncture—at once creating a product that is hyper-contemporary, while embodying the woeful nature of our technological addiction. 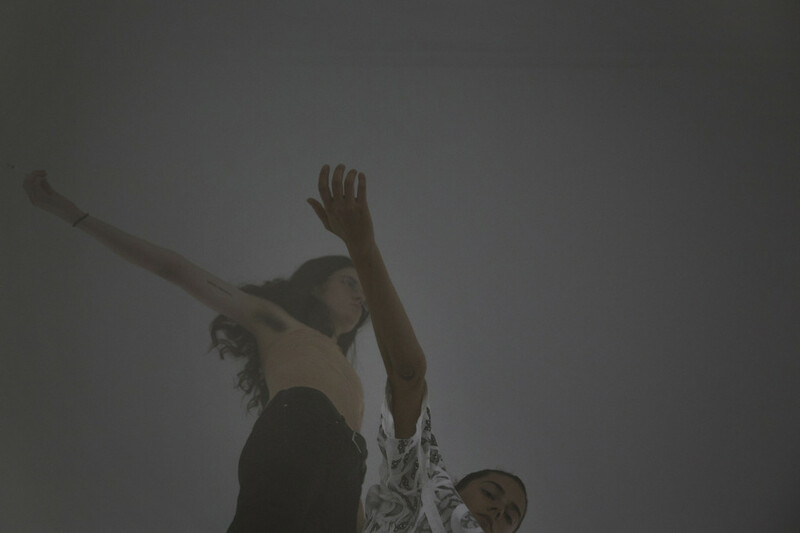 While Imhof’s work does not establish any schisms or wedges within the audience, the performers are interspersed and absorbed within the audience—similar to the work of Tino Sehgal, where the performers act directly on the plane of the viewers, but distinct, since multiple situations happen at once. The durational performances, each lasting from 8:00pm–12:00am, were orchestrated under the umbrella of Imhof’s choreography. The series begins with a woman walking on a tightrope through the vast hall of the space; alongside her is a drone that also weaves through the former rail station horizontally. The immediate sensation of instability is punctuated by the embodied alienation that the performers act out. Here, it is clear that it is an inhuman environment where these activities are generated, partly through the emotional recoil from smartphone paraphernalia. In the background, there is an ambient noise reminiscent of drone sounds and operatic noises. Beyond the fog, obscuring the vision of the viewer, there remains a current of alienation that delves deeper than the audience; the performers themselves appearing alienated from their own bodies, a separation heightened by the technology that defines their humanoid punk aesthetic. The inhumanness of the spectacle, as it was staged at both the Hamburger Bahnhof and La Biennale de Montréal, is reflected in the objecthood of sculptural forms within the installation space. Energy drinks and packets of soft soda line the walls—performers spill these acidic liquids as action painting, as well as vape from plastic e-cigarettes. Within the actual space, circular stairways line the hall in a geometric grid. These stairways are the closest thing within the installation that resembles a prop or a traditional set. Otherwise, the only atmospheric clue is the large amounts of fog within the air that makes it impossible for the viewer to see into the large expansive abyss of the space. Like the objects, which have phantom-esque properties, the performers are themselves ‘dead’ within the space. At points they sing somber songs, sitting against a wall and swaying together, at others, a performer slowly crowd surfs on the bodies in the space—though here, the popular action of crowd surfing is more reminiscent of a sacred composition. Overall, the performers act in a type of gestalt, making signs with their own bodies to slowly connect and merge with one another in a solemn manner. Predating Imhof’s immersive aesthetics is the notion of the Gesamtkunstwerk, a term developed by Wagner as a revolutionary art force that embodied a fully immersive art process integrating the sound, set design, audience, and actors of the performance. In 1851, Wagner wrote about Der Ring des Nibelungen (the indulgent operatic drama otherwise known as the Ring Cycle), “I can only conceive of performing after the revolution: only the revolution can provide me with artists and the audience.”  In thinking about this notion, of the necessity of a dismantled audience to form a link to the spectacle, Imhof’s work demands a total breakdown of social relations—establishing an immersive setting that viewers feel both drawn and repelled by. For Imhof, it is not only new associations to the museum setting, but new mythologies that form a queer/hybrid gaze. Specifically, Deal (2015), performed at MoMA PS1, concerns this specific deconstruction of associations—using a concrete basin filled with buttermilk, the performers dip in and out of what she calls a ‘currency.’ The basis of creating a horizontal gesture, out of a language that belongs to transaction, deconstructs the power of the performer. The specific gesture recalls Joseph Beuys’ social sculptures, which contained allegorical material, symbolic of the political realm. Imhof’s performative series recalls late-nineteenth and early-twentieth dramatists like Wagner and Brecht, who saw the theater as a crucible for cultural critique and contemporary activity. Though, what the audience experiences is an artwork disillusioned with its own contemporariness—in search not for an authorial voice, but for a commons. Perhaps acting out of loss, Imhof’s situations welcome us into an unstable horizon of a quasi circus-play. Unsure of what this spectacle could mean, the audience— which Wagner proclaimed was so integral to the stage—feels the fissure demonstrated through alienation, apathy, and emotional disconnect. For Imhof, the viewer remains a loose article of the performance, moved not towards self-reflexivity, but to a permanent immobility. 1 Richard Wagner, Sämtliche Briefe, vol. III 460. Quoted in Andreas Huyssen, “Monumental Seduction,” New German Critique, no. 69 (1996) p. 196. May 23, 2017 | Filed under Art Seen: International, PAST ISSUES and tagged with Anne Imhof, The Seen, Vanessa Gravenor.